A product that should have been designed long ago, I.V. House's innovative product brings a feasible and cost effective alternative to simply taping catheters to a patient's body to hold them in place. 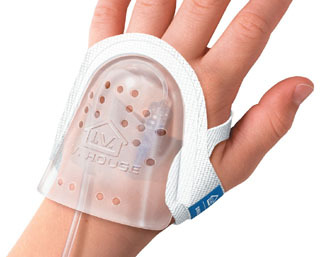 The Intravenous Site Protector Dressing helps prevent patients from picking at or pulling out their catheters. The design integrates a dressing wrap that offers comfort to the patient, and eliminates the used of tape over the traditional dressing. Credit: Metaphase Design Group, Inc.